This may be my most viewed blog post ever with that combination! First - there is the bunny. He likes the inside. I do NOT like him inside because guaranteed after about 5 minutes he will pee on whatever he is sitting on to mark it as his. The dog is not amused, although she is outweighed so she by and large shuts up about it and just glares. 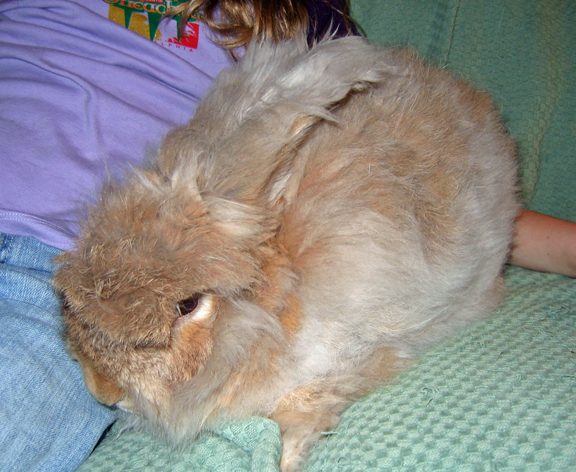 But when it is cold outside, the Kid tends to smuggle the rabbit in as soon as my back is turned. Just a few days ago, I came out of the shower to find Cameron happily hopping around on my bed. He was happy - I was not. And then the sock yarn. A little forward movement on the Tofutsies socks. This photo for some reason looks way darker here than it did when I took it - will have to try again tomorrow. This is the sock pattern I am designing for SWTC. A knitted rib top, crocheted openwork leg, then back to knitting for the heel, foot and toe. I did a sample in a wool/cotton blend, but this stuff threw me. It is VERY light, very fine yarn. And soft, did I mention how soft it is? It is waaaaaay soft. Made up of 50% superwash wool, 25% soysilk, 22.5% cotton, and 2.5% Chitin. So I had to go down a needle and hook size from the original sample. 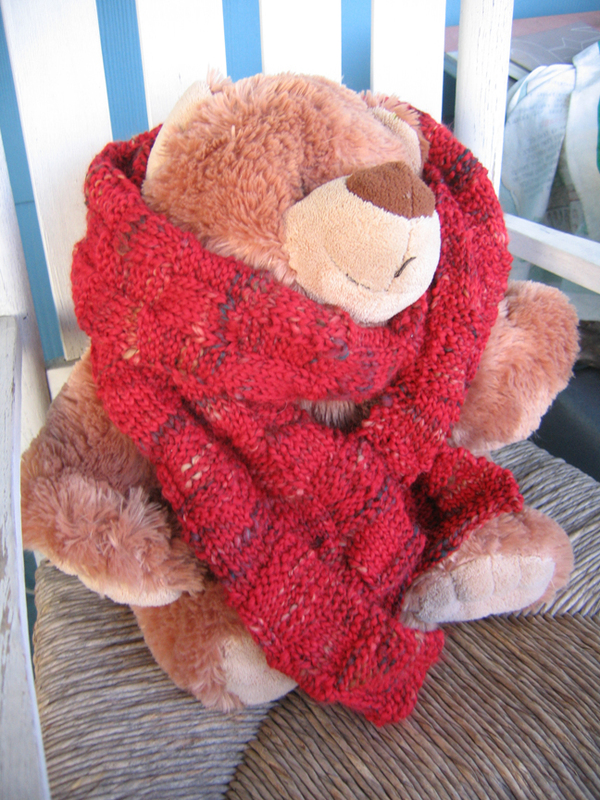 This is knitted on size 1 dpns, and crocheted on a C hook. What is Chitin, you ask? I didn't know either, so I will quote from the label "Chitin is fiber from shrimp and crab shells! It's naturally antibacterial!" Exclamation points are courtesy of SWTC, not me. This is not a tightly spun yarn, and it is an 8 ply. 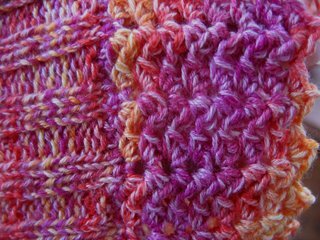 I had a few minutes of aggravation with splitting, but I got past that very quickly - I think it just takes a few rounds to get used to the yarn. As you can see, it is a variegated yarn, not a self striping one. 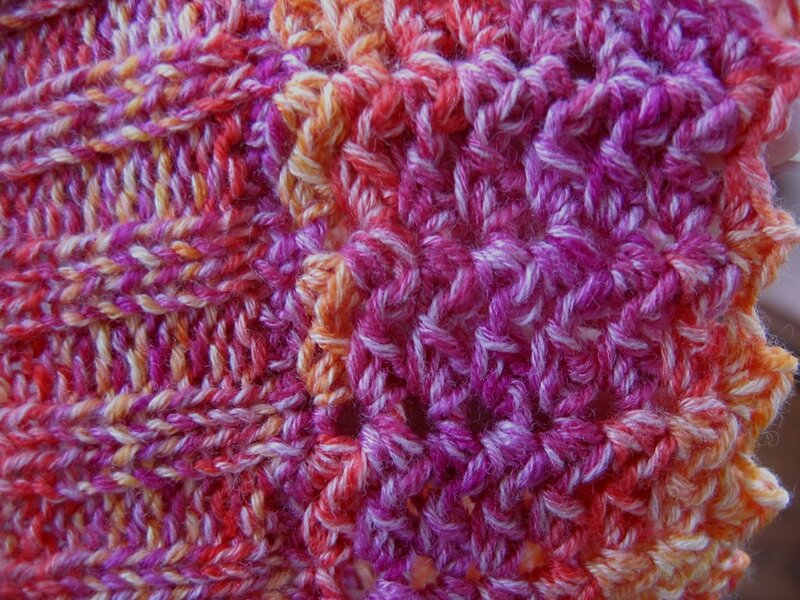 It is doing some interesting pooling on the crochet leg - I can't wait to see if it does the same thing on the second sock, or takes off and does something different. More photos as things progress. Today I need to progress on a costume - the Kid is going to make an appearance this weekend at a theme party as Alice in Wonderland, and I have to finish the dress. I liked it much better when she didn't realize I really could make her any sort of outfit she wants, she was much less demamding then! Now with actual knitting content! The Tofutsies sock yarn finally arrived - here she is! While I am dying to work with it, I promised SWTC that the sock pattern I am writing will ensure that the sock knitter will be able to get a whole pair of socks out of one skein, so the first thing I want to do is ball up the yarn into two equal skeins so I won't get carried away and use more than half a skein for the first sample sock. Hopefully tomorrow - I need a scale. And here we have Red Scarf 2007! Of course it looks much lovelier on BB than in the close up. Don't ask me what the yarn was because I already forgot... something red with some black and tan accents, sort of fuzzy, very soft, mostly acrylic with some wool thrown in for good luck. Okay Norma - I found the darn label - it's Dover Indena! Made in the basic 5 st x 10 row basketweave pattern with a garter stitch border on all four sides. Yummy, warm and long, and best of all finished! 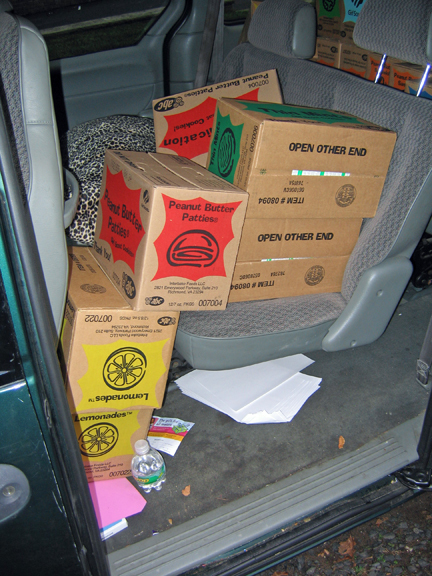 We never got Thanksgiving dinner - we were off to my niece's house when she called to report that her two boys might possibly have the flu and didn't I think it would be better to not expose the Kid to that less than 24 hours before her big event? I agreed that was a fine idea, so we high-tailed it to the hotel, flopped in bed and got a movie (Material Girls with the Duff sisters - not really my tasted but the Kid was enthralled) and room service. I did finally get the leftovers my sisters saved for me on Saturday for lunch - better late than never. Friday was all dance all the time, Saturday was a small local (to my parents' house) holiday parade followed by a craft show and some more family time, and Sunday we drove home and did all the laundry from the weekend. Back to work, and hopefully some more regular blog posts now that Oireachtas is over for the year. Is step dancing season over yet? How about now? I love the Kid, I really do, but I am SO sick of driving to competitions and classes, and doing alterations on all of her friends dresses as well as her new one, that my head is spinning. Regional finals this Friday, then things will calm down until next February or March. Amen. To distract you from my whining, some glove photos. at a feis last week and got some pretty odd looks. Wasn't there a horror movie with a character called Pinhead? Meet PinHand! 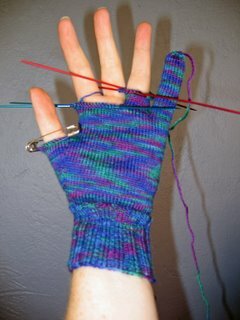 The first glove is actually all finished now, but I have been procrastinating about casting on the second one. It can't be SSS if it isn't a sock, right? Maybe tomorrow at dance class. Because I am completely insane, I started a lace project. I have been avoiding the whole lace thing for a while, but a 25% off coupon at Borders combined with a 5,000 yard cone of Zephyr laceweight calling to me from the stash, aided and abbetted by a run in with Folk Shawls - and well I just couldn't help myself. I started the Highland Shawl from Folk Shawls. It is trying to beat me at its own game, but I am on to its tricks so far. 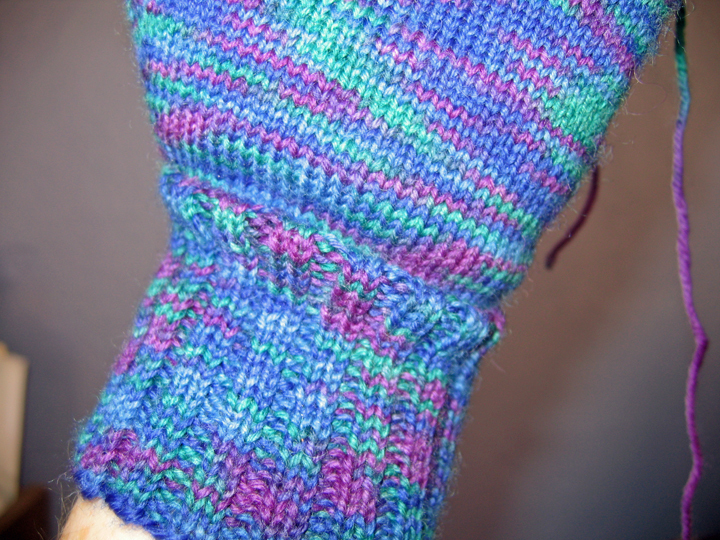 But I will be relying pretty heavily on the magic of blocking if this thing is ever going to be wearable. I thought I was a pretty good knitter, but I can't believe the number of minor mistakes I have made already! Knitting book cruising along. I finally got the Indiana book file ready to email to the company that is going to print it, only to discover that it is way too big for the relevant URL, and I crashed their server. Oops... Hopefully I can get that resolved way soon, because I would love for that to be out for holiday giving. Yay for the minivan - we're back! The Kid sold a lot of cookies. These aren't actually all her sales, but more than half of them are. She has learned to bat her eyelashes and toss her blonde hair and look beguiling at unsuspecting neighbors until they are positively strong armed into plunking down $3.50 a box. Hee... 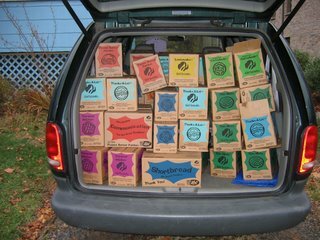 I need to get these sorted out over the next few days so they get to the person who ordered them, but after 5 years in Girl Scouts we are a pretty well oiled cookie machine. The Kid also had a stellar weekend dance-wise - she competed in 10 events over two days and walked out with a 1st place finish (the first time she ever outright won one of these things and she is deliriously happy) a 2nd and two 3rds. Now we have to live through her team event at the Oireachtas the day after Thanksgiving, and the season is over. Amen. The van broke down on the way home from her second competition - thankfully we were close enough to my parent's house that we just went there. This is the same fried alternator crap that I went through 6 or so weeks ago when I nearly crashed. So I had AAA tow it to the dealer and told them they HAD to make this never happen again, as it was getting really old, expensive and frightening as hell. The good news is it is supposed to be completely repaired. The bad news is I had to stay at my parents a few extra days waiting for the needed parts to come in. I love my parents, really I do, but I don't actually want to live with them anymore, ever. The Kid got to ditch school on Monday which she loved, but made it back for yesterday. I didn't get home until last night. To anwer comment questions - no I am not going to Neiman this year, although I wish I was. Yes, my daughter wears the awful poodle/tight curl hair style when she competes, but I am no dummy and bought her a full wig a year ago. That curling iron thing got real old, real fast. And about the new sock yarn - I came home to an apologetic email saying the box hadn't been mailed yet, but I am hopeful it will be here soon. I PROMISE pictures, really I do! Back to sorting cookies.... at least I get to eat some. Two hours and two hundred light years from civilization - car broke down, waiting for parts in a town that contains both of my parents and no WiFi connection. Send good, yarny thoughts for me and my car. I finished the first glove and don't have the yarn for the second, and am about to finish the scarf I brought as an emergency knitting project. If the car isn't finished soon I am going to have to buy yarn just so I don't go batty! Wish me luck - real blog post as soon as I can. And because I really wanted to try a video entry. 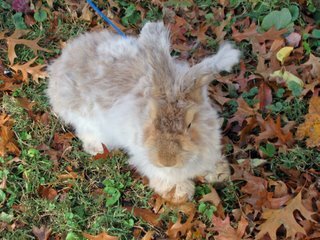 Here is 30 seconds or so of Cameron T. Bunny in his favorite outdoor spot. 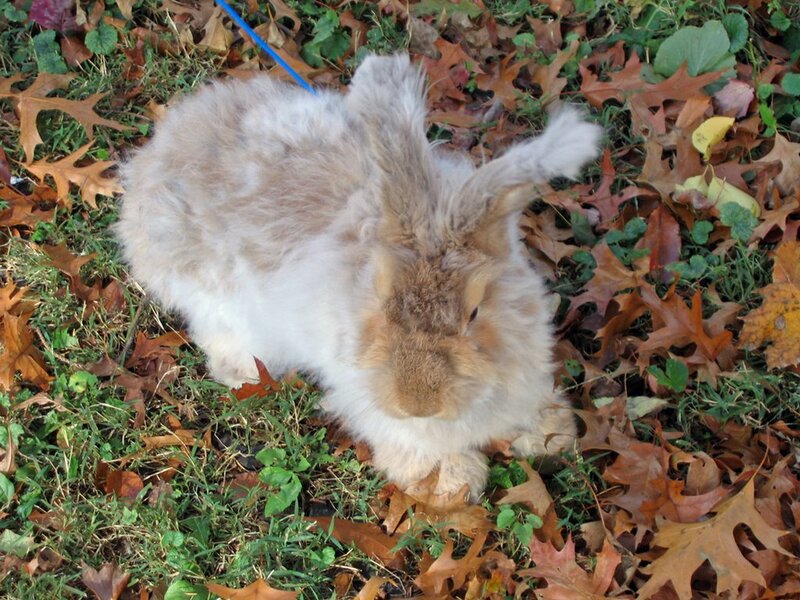 He likes the outside, really he does, but it makes him so gosh darn dirty which he really can't stand. It isn't scintillating video, but hey, a test is a test. 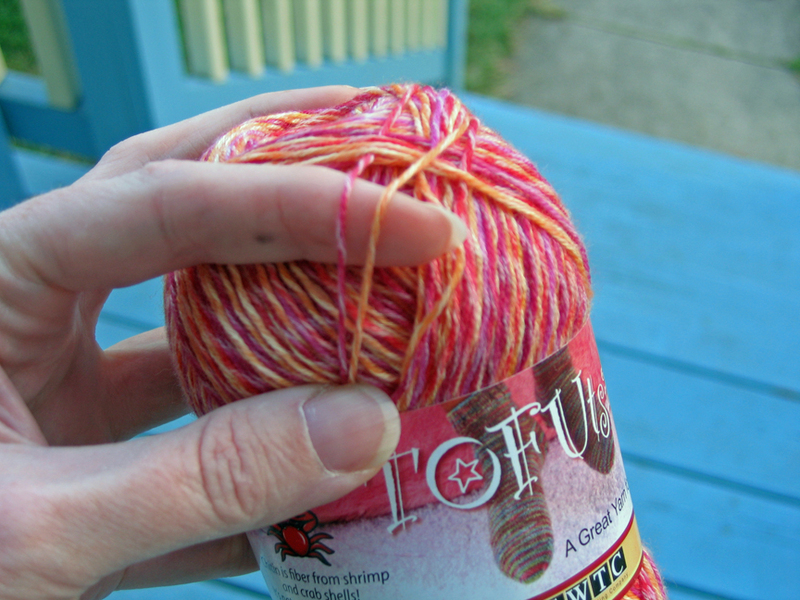 The new sock yarn isn't here yet, but I do promise to take copious photographs as soon as it gets here. 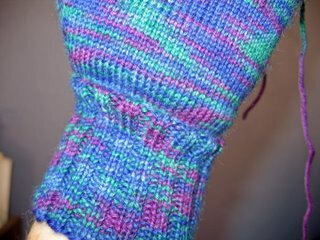 I got totally bored with all my WIPS and started a pair of simple gloves on bitty needles, which is keeping me amused at the 912 dance classes the kid has yet to live through before her big step dancing event on Thanksgiving weekend. I also finally bought her a solo dress (for you step dancer-readers)/really really really fancy and way too expensive dance costume (for you non-step-dancer-readers). Thank heavens I can do her alterations myself as this one needed some work - the girl who had it before her is her build and coloring but 5 inches taller! It is gorgeous though, and she will wear it this weekend at the New Jersey State Feis for the first time. Not much happening on the design front. Lots happening in writing world. I am so happy to report that the knitting book has a new title that makes both me and the publisher happy. This is its third title, and hopefully the last one. Knitting is Better Than Therapy. By Mary Beth Temple. Winging its way from Andrews McMeel to your LYS in October of 2007. Cammie Digs the Back Yard! 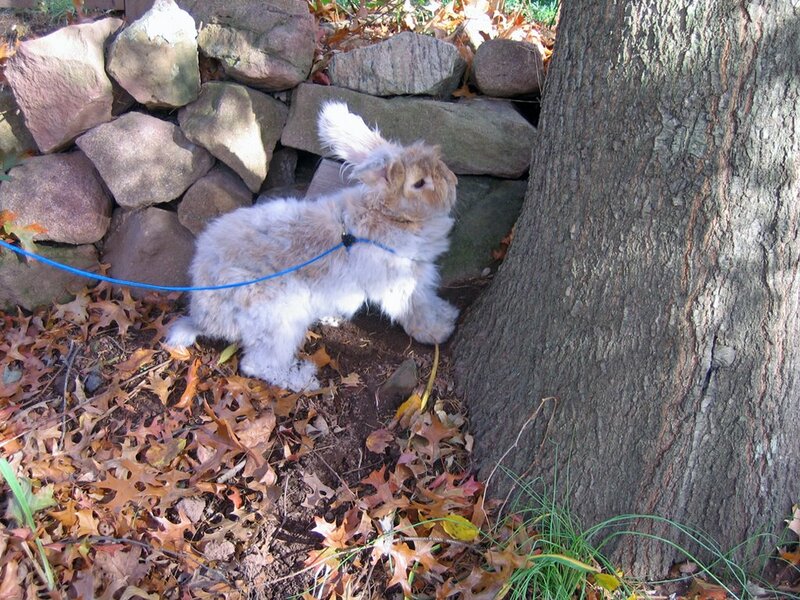 Cameron T. Bunny has been settling in here at Chez Alpaca, and with the addition of a ferret leash to his accoutrements, has been exploring the back yard. He likes it a lot - it is a giant salad bar as far as he is concerned, and there are many cool places to hop around in. Here is Mr. Giant Paws working on his second home. He loves this corner and has started a little excavation project. I suspect a multi-level burrow is in the works. I guess he gets bored re-decorating his cage, although he does re-arrange his carpet square and chew toys a few times each day. On a bunny-free note, I never got around to finishing the Halloween post, so will catch up now. On Monday the 30th, the Kid and I went to see Melissa Leapman at The Skein Attraction in Teaneck, NJ to get a signed copy of her new book, Cables Untangled: An Exploration of Cable Knitting . I had interviewed the lovely and talented Ms. Leapman for KnitnStyle magazine (the interview appears in the December issue that is out right now) and met her in person at the Knit and Crochet Show this past July, and wanted to show a little support since she was so close. I had a great time catching up with her, and I really like the book. 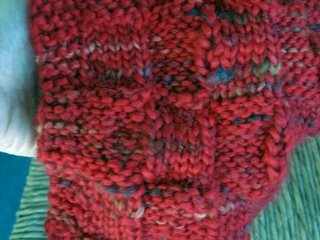 I have had a Celtic sort of cable pattern in my head for the last few weeks and with the book's help I want to chart it out. 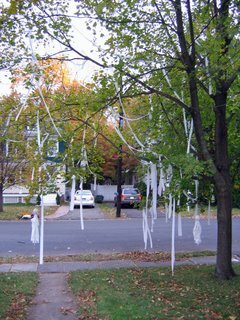 The view from my front porch - showing my freshly TP'd tree. I give a certain group of tweens in the neighborhood permission to have at my tree, because I know they won't do anything stupid, and because it is "their" tree, no other stupid teens will touch it. Genius, no? The Kid had a blast and came home with 8 pounds of candy. That is not a typo - 8 POUNDS! Thankfully she tends to lose interest in it rather quickly and I will wind up throwing at least half of it away in the next few weeks.